In this article we will be reviewing what is a space warp and how a warp drive would work. In essence a space warp allows you to distort space-time around you, allowing to travel to a destination beyond the speed of light, while locally you are never breaking the light barrier. Instead space-time around you is going faster than light, meaning that your destination is come towards you and your point of origin is being pushed away. However, it is space-time that is taking you there and not you actually using momentum to get you there. If you imagine the surfer, the surf board, the ocean and the waves. The surfer is you as the pilot controlling the surf board. The board is the craft that you are controlling, and the ocean is the fabric of space-time and the waves are the space-time distortion. As you ride the wave you are not moving but the forces of the waves and ocean is pulling and pushing you along. Another analogy is walking along a walk way at an airport. As you walk on to the walk way you are walking at the same speed as everyone else but you are being pulled and push along , so you appear to be moving faster than everyone else who is not on the walk way. These are really primitive 3D terrestrial representations but to give you the idea. If you look at the following video interview with Dr Harold ‘Sonny’ White whom was interviewed by the press into their Warp Drive Experiments at NASA he gives an explanation on this. Space and time are interwoven together as Einstein showed they are not separate. This is an essential ingredient if a space warp is to work. 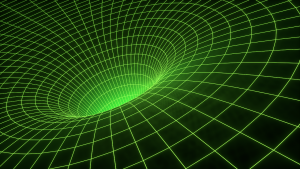 In physics space-time is a mathematical concept that shows space and time are inter-connected into a single interwoven continuum. Space in our universe has been interpreted by having three dimensions and time being considered the fourth dimension. So with combining time and space as a single manifold, scientists have been able to greatly simplified many physical concepts. In addition of a way to describe uniformly the operations of the universe at both subatomic and super-galactic levels.